In this short article, we go over how to make proper cloud mining calculations. We aim to provide you with a calculator by which you can rate cloud mining platforms in terms of profitability/ROI. Calculations of the fees and revenues must include several indicators, them being a mining difficulty, price fluctuations, maintenance fees, and payouts. We also stress the importance of deposit & withdrawal methods, as these might carry additional costs. The article concludes with an analysis of ROI in the past as to provide tools on how to avoid scams. We benchmark payouts with mining results according to the industry difficulty. In the following sections, we provide you with different aspects of cloud mining that you should include in the calculator. Below this text, you will find a template that lists all of these factors for you to use. You can edit the tool in excel according to your needs and is made for cloud mining starters. The example below is made for Hashflare, with data sued form recent contract values. tremendously, due to a large number of market entrants. mined. You can check out the difficulty rate for the past year in the chart below. The difficulty, thus, impacts the level of daily payments. The more difficulty, the less payout volume you get from cloud mining. Another important aspect of the mining difficulty is that some platforms might even award you with lower payouts than what difficulty allows. You should always benchmark your daily gains with difficulty on that day for that reason. Apart from mining difficulty, daily changes in coin’s value also impact your fortunes. Even if difficulty falls down, if its value goes under as well, you will find yourself making less money since you can sell these coins at a lot lower value than when you purchased the contract. 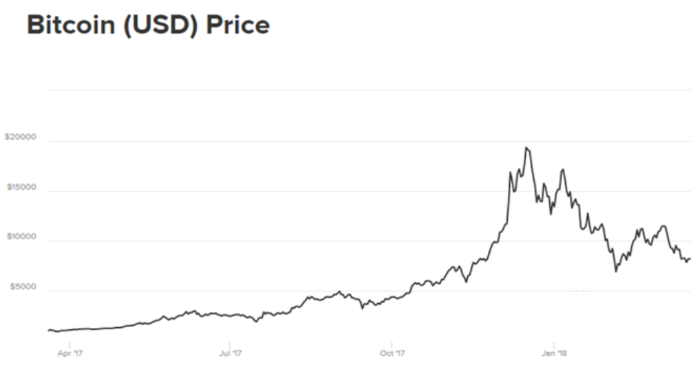 Bitcoin, for example, has seen a large increase at the end of the year in its price tag. Then, equally fast, BTC experienced downfall at the beginning of 2018. You can check out the said movement in the graph below from CoinDesk. Since payouts are made on the daily basis, the value might change rapidly. In most cases, cloud mining investors would gather up coins in a wallet for some time, usually a week, and then deposit them back to an external wallet. They would keep the asset until they can get a favorable price. The contract’s price is what makes you make or break the deal when it comes to cloud mining. The initial investment you have to make at the beginning will determine how big (or small) your ROI will be. Taking into account maintenance fees, these costs vary from contract to contract and from crypto to crypto. 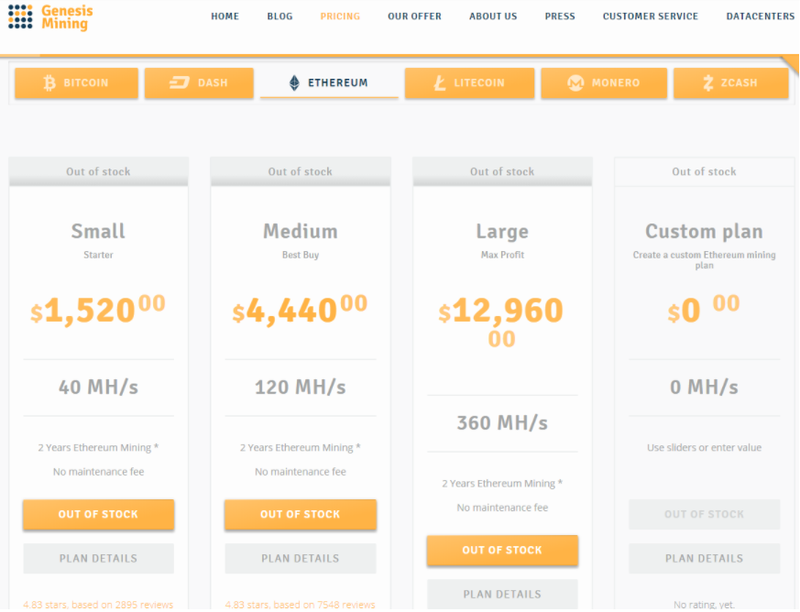 Below, you can find Genesis Mining’s program costs for Ethereum. Price also varies according to the available hash power. Several other platforms providing you with the ability to make very small investments or to go all in. Apart from maintenance fees and initial investment, you should also account for potential costs when depositing/withdrawing funds. Some platforms, like Hashflare and Genesis Mining, allow you to purchase hash power using fiat currencies through credit cards and bank accounts. Usually, there are no fees charged by cloud mining platform, but your card issuer or bank might make you pay a small fee as well. Withdrawing coins always come with small miner fees, which change from day to day. Most cloud mining companies would charge you maintenance fees for BTC mining, as equipment used takes a lot of energy. Thus, electricity bills of the company are essentially paid by you. These are, right next to initial investment expenses, quite important to take account of, as they can be quite expensive. Other than bitcoin, cryptocurrencies such as Litecoin, Ethereum, and Zcash usually do not hold these fees. The reason behind this development most probably lies in the fact that BTC mining is still one of the most popular ones in the industry.Thus, most of the electricity bills are thus attributed to bitcoin. Once you have nailed down the difficulty, it is time to calculate how much of daily payments you will get. Simply use hash power calculators available online to get coins per day. Then, use a large platform like Bitfinex to get the current sale price of the crypto. In this way, you now have calculated revenue. Be warned that both difficulty and price change on daily basis. Thus, you can only use approximations on what your ROI will be in a year. Cloud mining communities come very handily should you wish to check previous payouts. You, as an investor, need to know if the company providing these services actually adheres to difficulty rates. If not, chances are you will get a lot smaller payments on a daily basis than you should. You can also check out if payouts are regular, as some cloud mining providers might skip several days of payments. In this cloud mining calculations review, we provide you with a calculator to use when choosing cloud mining programs. Suffice to say, due to the ever-changing market, caution is needed. You should definitely calculate the ROI with mining difficulty, crypto & contract price and fees taken into the account. Cloud mining remains an interesting industry to be sure but you should also consult communists on the previous payouts. 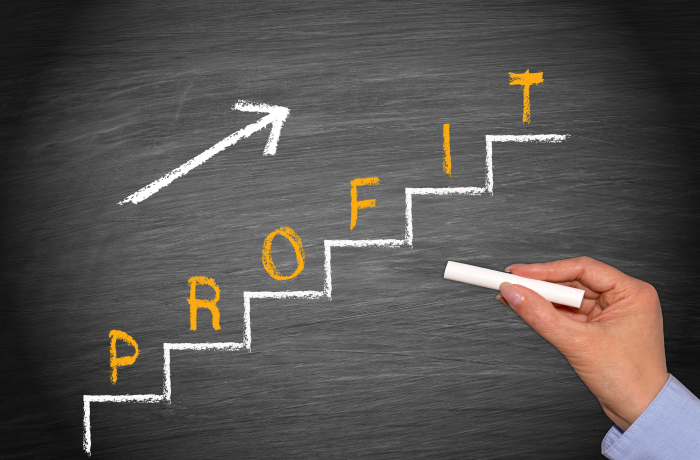 The more information you gather, the more accurate your ROI analysis shall be.